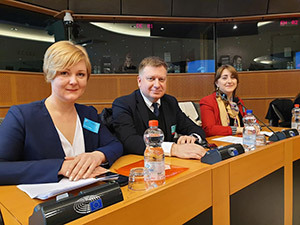 On April 11, 2019, Association Rural Development for Future Georgia (RDFG) attended the conference “LEADERs developing local communities” held in European Parliament. 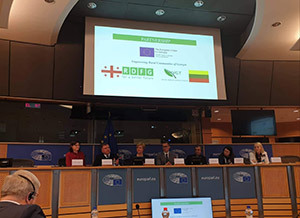 The event was initiated by the Greens/EFA MEPs Mr. Bronis Ropé, Mr. Martin Häusling, Mr. Davor Skrlec and its main purpose was to discuss LEADER’s place in Common Agricultural policy (CAP) and prospects post 2020. Within the conference, Vano Grigolashvili, the chairman of RDFG, delivered speech about the EU-funded project “Rural Development for Sustainable Growth in the Tetritskaro Municipality” and highlighted the importance of the European LEADER approach in the rural development process in Georgia. 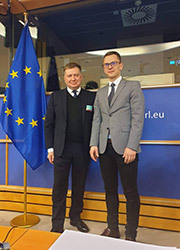 Moreover, he spoke about the successful cooperation between Lithuanian LAGs Network and RDFG. The Conference was organised with a view to having an inclusive event, linking decision-makers and most active practitioners of Local Action Groups (LAGs), involved in implementation of the LEADER projects, in order to provide them with an opportunity to discuss the new CAP post 2020, share experience and to network for new project ideas. During the first part of the conference, European Union representatives delivered speeches about the main provisions, trends of the CAP reform and proposals for the LEADER Programme in the sketches of the future legal framework. They have discussed what the new CAP post 2020 will mean for LEADER, what changes in rules, approaches and priorities should be expected. The second part of the event was dedicated to the representatives of local action groups’ (LAGs) presentations. On the one hand, they have discussed the success stories of the implemented projects and on the other hand, they have debated on factors hindering participation and performance. They have also highlighting different themes, delivery approaches, obstacles and recommendations for empowering LEADER instrument. The event was attended by 70 participants, including local actors and practitioners (most prominent local action group coordinators, most active leaders of rural communities from Lithuania, as well as representatives from Germany and Croatia). From Georgia Vano Grigolashvili, the chairman RDFG and and Nelly Revazishvili, rural development project manager took part in the conference.